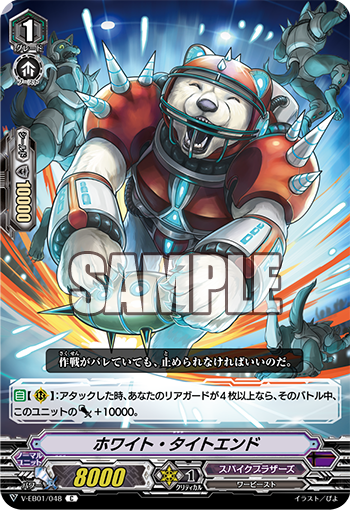 The Japanese card of the day for June 12th, 2018, is a Spike Brothers Common from V-Extra Booster 01: The Destructive Roar, the grade 1 White Tight End. White Tight is a powerful grade 1 attacker that swings for a magic 18k on his own, making a 31k column with Wonder Boy or 30 with Funky Bazooka active. The fact that a solo White hits for exactly the number required to make a base 13 vanguard drop 10+ shield should be kept in mind going forward because one of Spike Brothers' overarching mechanics is pumping up rearguards and sending them back to the deck after they attack--give tighty-whitie here a Standard version of Bad End Dragger, and you have a 28k solo polar bear ready to smash face. That said, on the best of days White Tight is a substitute for Highspeed Brakki. His role is similar to Reckless Express in the old format, a booster of reasonable power that can become an attacker when your options are limited. The previous Japanese Card of the Day was Machining Hornet.